Saturday morning was beautiful and the time for an early morning walk along the riverbed. 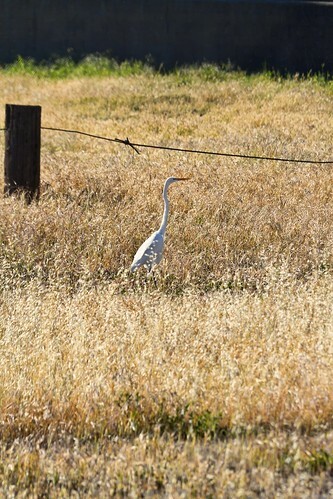 On the way back, we spotted this bird weaving its way through the tall grasses on the east side of the Rio Hondo River. It believe it is a crane. They are such interesting-looking birds, awkward looking, but graceful in movement. According to a little research on Wikipedia, cranes nest in wetlands and move into grasslands to feed. And this kind of looks like grasslands....I have to admit it is fun to still experience little surprises of nature in the middle of suburbia.